The Pistol: The Birth of a Legend (1991) A story about the great basketball player "Pistol" Pete Maravich when he was in the eighth grade. He plays on the varsity basketball team at Daniel High School but has some very difficult obstacles standing in his way of playing. The only support he has is from his father, retired basketball pro Press Maravich. 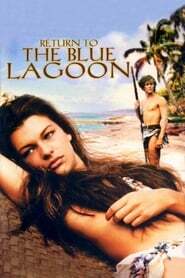 Return to the Blue Lagoon (1991) In this sequel to the 1980 classic, two children are stranded on a beautiful island in the South Pacific. With no adults to guide them, the two make a simple life together and eventually become tanned teenagers in love. Teenage Mutant Ninja Turtles II: The Secret of the Ooze (1991) The Turtles and the Shredder battle once again, this time for the last cannister of the ooze that created the Turtles, which Shredder wants to create an army of new mutants. Delirious (1991) A soap opera writer gets hit on the head and wakes up as a character in his own show. Night on Earth (1991) An anthology of 5 different cab drivers in 5 American and European cities and their remarkable fares on the same eventful night. A Rage in Harlem (1991) A beautiful black gangster's moll flees to Harlem with a trunkload of gold after a shootout, unaware that the rest of the gang, and a few other unsavoury characters, are on her trail. A pudgy momma's boy becomes the object of her affections and the unlikely hero of the tale. Defending Your Life (1991) In an afterlife resembling the present-day US, people must prove their worth by showing in court how they have demonstrated courage. The Doctor (1991) Jack McKee is a doctor with it all: he's successful, he's rich, and he has no problems.... until he is diagnosed with throat cancer. Now that he has seen medicine, hospitals, and doctors from a patient's perspective, he realises that there is more to being a doctor than surgery and prescriptions. Beauty and the Beast (1991) Follow the adventures of Belle, a bright young woman who finds herself in the castle of a prince who's been turned into a mysterious beast. With the help of the castle's enchanted staff, Belle soon learns the most important lesson of all -- that true beauty comes from within.